Last weekend was full of crossing things off the South Africa bucket list! 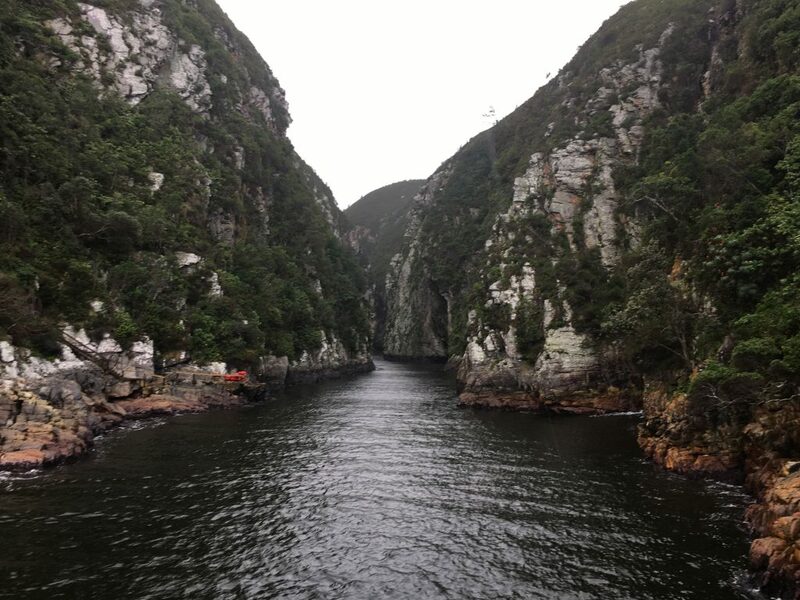 IES organized a road trip for us along the Garden Route, a stretch of southern South Africa that is made up of farmland and some incredible sights. We had an early morning Friday to drive to our first destination, Wilderness. Wilderness is home to the Touw River, where we got to canoe and look at the mountains and hills surrounding the water. It was a bit chilly to be canoeing, but still a fun way to experience Wilderness and do some sight-seeing. 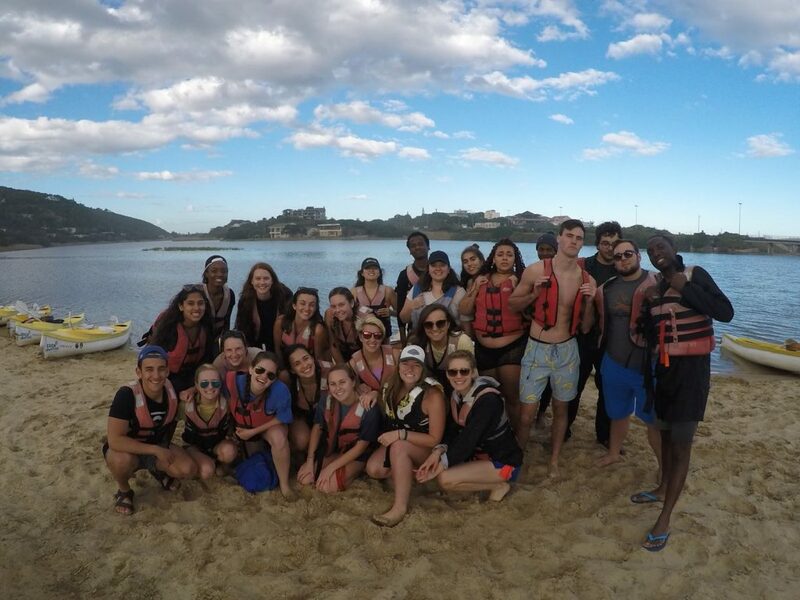 The IES group on the beach of the Touw River after canoeing! 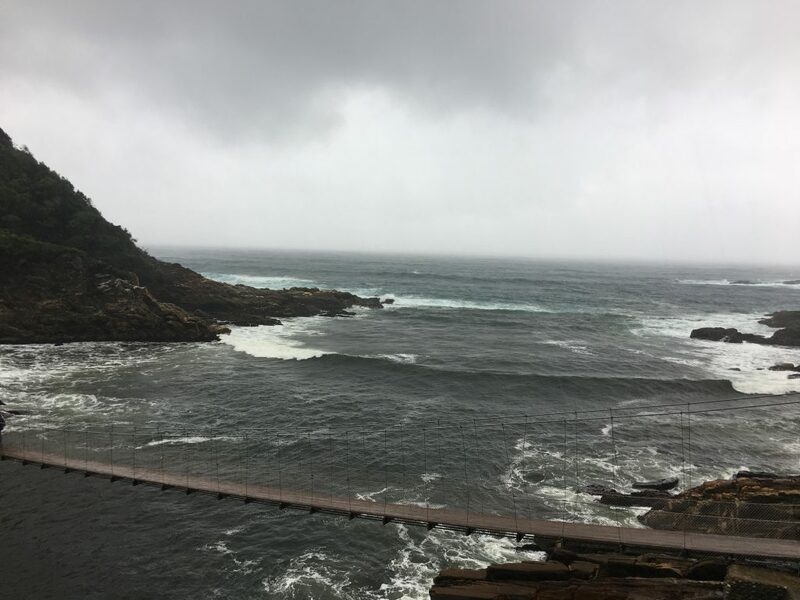 On Saturday we made our way to Tsitsikamma National Park and hiked to the suspension bridge that overlooks the Indian Ocean. Despite the pouring rains, this hike was amazing. The views were spectacular and full of beautiful plant life and animals. Once we made it to the suspension bridge we were able to walk across and see down the river between the mountains on one side and out into the ocean on the other. It stopped raining right after we crossed the bridge, so we were able to walk back to the beach rain free which was a nice break, even though we were all already drenched. 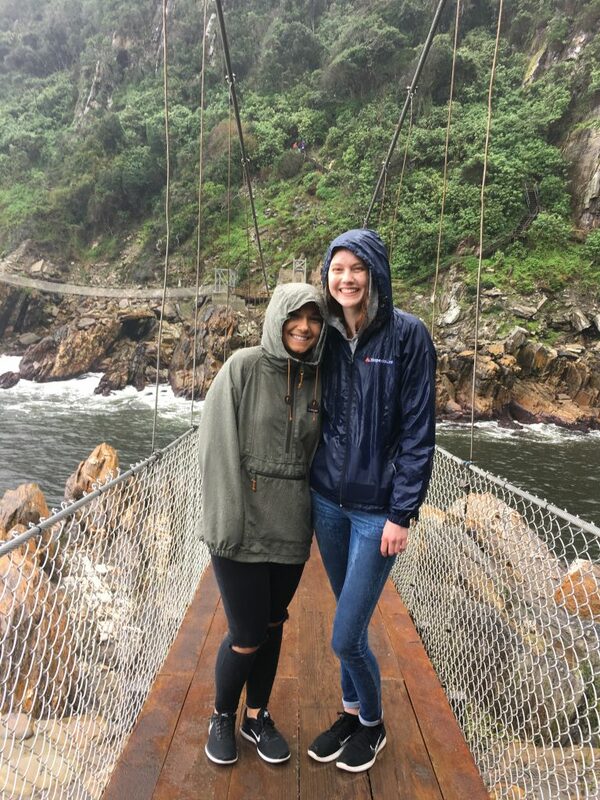 Sarah, another Hope student, and me on the suspension bridge at Tsitsikamma National Park. View of the mountains from the suspension bridge. View of the suspension bridge and the outlook of the Indian Ocean. After we dried off a bit we had the choice of going to four different animal encounters: monkeys, birds, big cats, or elephants. The majority of people chose the same as me and went to the elephant reservation where they save elephants from zoos and trafficking to put them in a natural and safe environment. We were able to get up close with the elephants and meet them which was one of the most exciting parts of this trip! 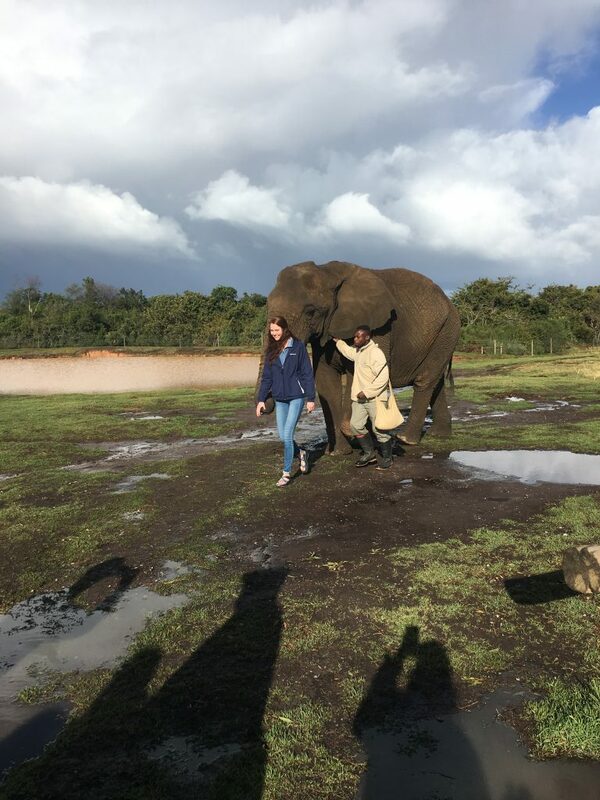 We got to walk with the elephants while holding their trunks, pet them, feel their ears and tails, and hug their trunks. 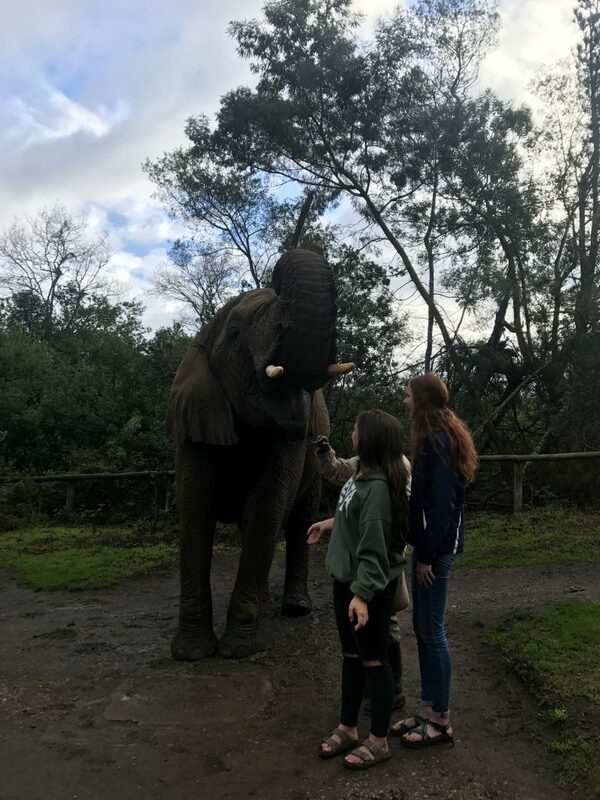 I also got to feed them chunks of cantaloupe and they grabbed it right out of my hand with their trunks and tried to take it from my hand even if they weren’t the elephant I was trying to feed. It was a really fun way to encounter elephants and learn more about them! Learning about the elephants from our guide, Charlie. 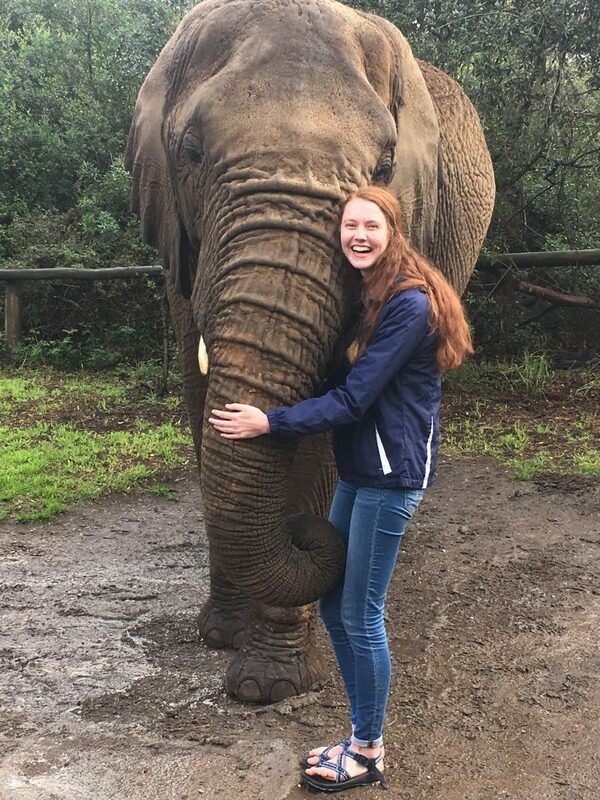 Giving the elephant a hug! Sunday, our last day of the Garden Route trip, we headed to Congo. In Congo we went to the famous caves that were discovered by a Dutch farmer who was looking for a lost sheep. We did the adventure tour, which meant that we had to crawl through tight spaces to get to some of the caverns. The rocks and formations inside the caves were really cool and took hundreds of thousands of years to form. Even though some of the crevices we had to fit through were tight and a little nerve-racking, it was definitely worth it to see what the caves had to offer. Our final stop on the trip was to an African ostrich farm. Ostriches in South Africa are farmed for their meat and leather and are also used to herd and protect sheep. There was a handful of ostriches that they let us interact with. The first ostrich we saw was a dwarf ostrich who had a mutation causing him to be significantly shorter than the typical ostrich. We were able to feed him pellets out of our hands, and he had a surprisingly powerful bite and sharp beak. We then met Betsy, a full grown ostrich that the farm rescued. 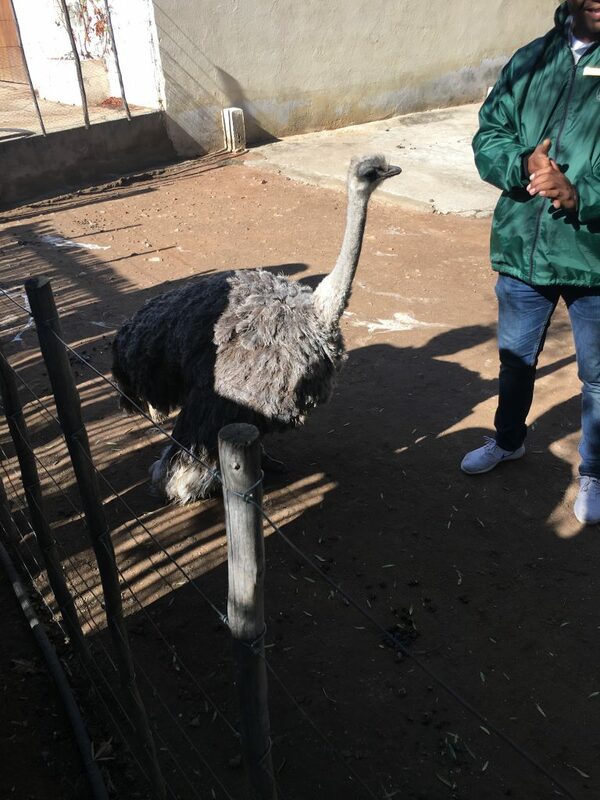 The tour guide said that Betsy is an unusually friendly ostrich, whereas typical ostriches are very aggressive and protective. 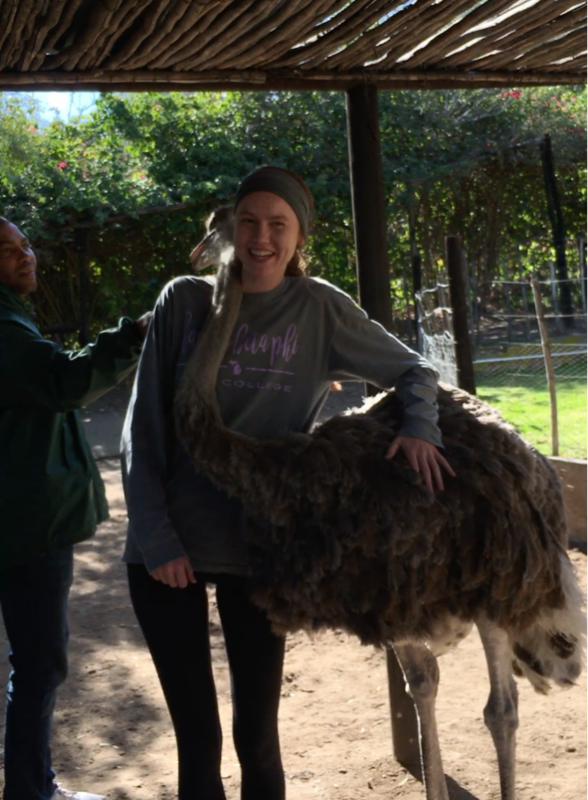 Since Betsy is friendly and enjoys being around people, everyone got a chance to pet her and get an ostrich hug! The tour guide then asked us if we wanted to get an ostrich neck massage. We figured this meant standing with your back to a bunch of ostriches while holding a bucket of food. 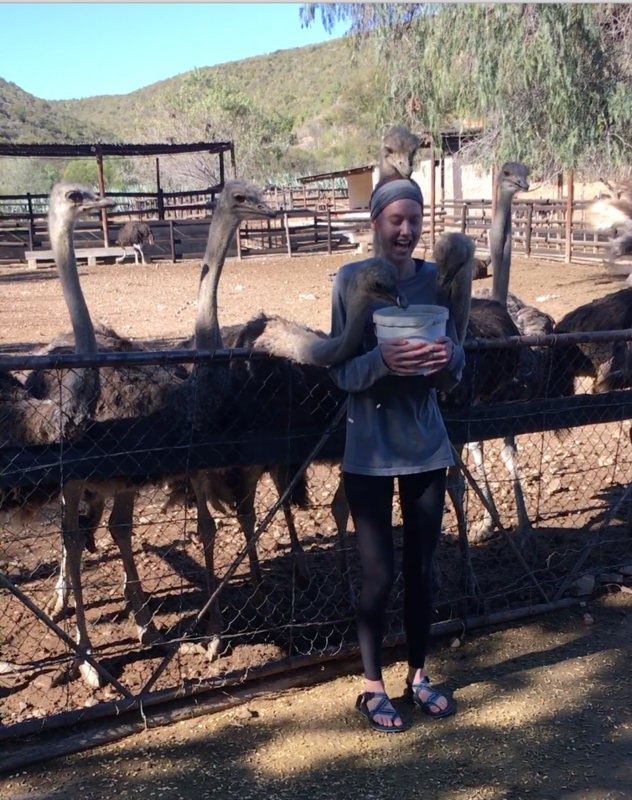 The ostriches reached over my head and around my neck in order to eat from the bucket. They were going at the food pretty hard and I definitely got hit in the face by an ostrich head a couple times, but it was worth it. The dwarf ostrich – significantly shorter than the average ostrich. Getting a hug from Betsy! Getting a neck massage from the other ostriches by feeding them! It was a really fun trip and a neat way to see more of South Africa other than Cape Town, but I am definitely excited to be back in Cape Town and become more familiar with the city I will be living in for the next four months! Previous Previous post: My Last Week in Paris! Next Next post: Paris Reflections!